Strolling on the streets of DC! Spotted on trip to Seattle. Jenn's bag. Has Vera, will travel. 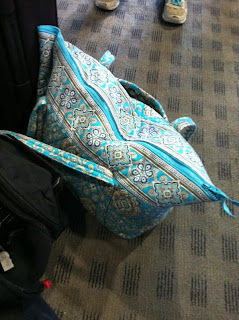 My friend at work showed up with her suitcase and Vera Bradley Metropolitan in Baroque. She is working a half day and then is headed to Cape Cod for the holiday weekend. I really want a Metropolitan! I am thinking maybe Deco Daisy to match my red suitcase! 1. If you aren't following me on facebook you should be! Sometime there are little quick things that are worth mentioning to you all, but not long enough for a blog post. So you might have missed the post from Monday that let you know that the new Fall 2011 items are online at verabradley.com so that you can check them all out! They just arent available for purchase until July 7th. 2. The outlet stores are having an amazing sale! Which kills me since I am trying to save up some money to get some Happy Snails stuff! June 30th - July 4th everything in the store is 30% off (excludes rolling luggage). What a deal! I am tempted to get the Vera Vera Convertible Tote. 3. 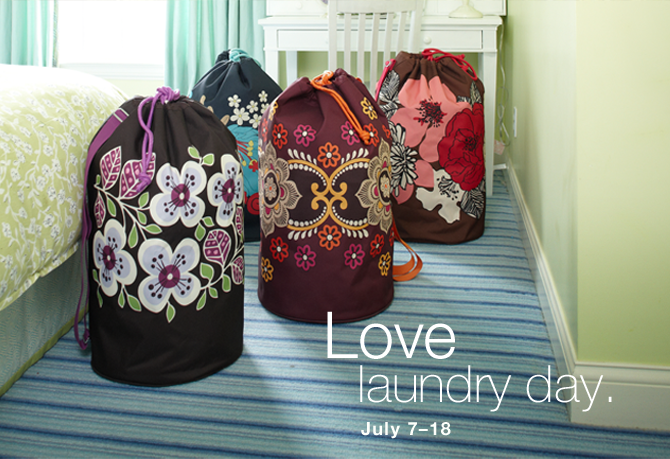 Check out these laundry bags that Vera Bradley created for the Fall. They are a little pricey, but if you need a laundry bag, you probably wont find a prettier one any where else! 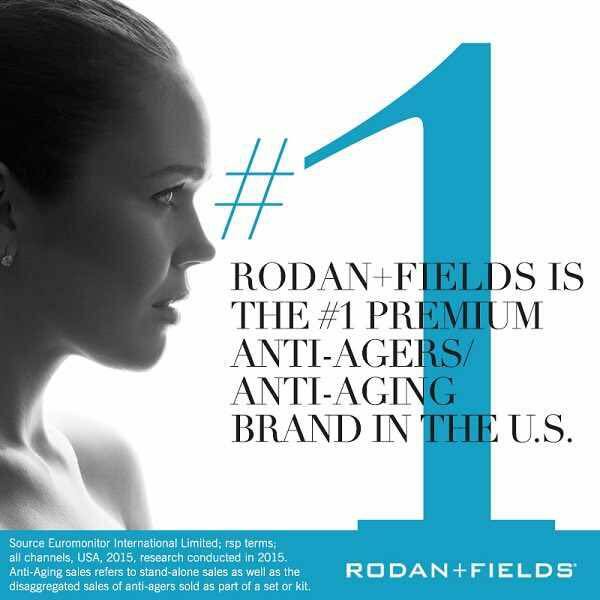 Click here for more about the promotion they are doing. Another Vera Sighting from Sarah D! I love a double Vera Sighting! Vera Sighting from OhMyVera! rader Sarah D! Thanks Sarah, that is a lot of Vera! Seen at St. Louis Cardinals game - 6-26-11! 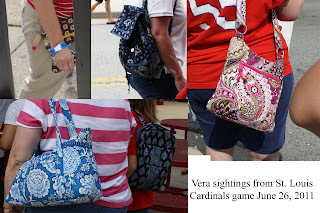 Check out this new video on You Tube that Vera Bradley posted! It has the new Fall colors. I am getting even more excited for them, I really like all four! They will be in stores July 7th! There is a bag that looks like a new one that I am interested in. It plays at around 30 seconds and again at 50 seconds. I wonder if it is a new signature line bag or a special collection. If anyone knows, let me know! Update: the bag is called a Chain Bag and retails for $78! You can view the Fall 2011 Catalog by clicking here. At the mall with a Vera Bradley store, but not going in for fear of buying something I don't need. I have to wait until the new Fall colors come out on July 7th! Check out this really fun, cute jewelry from Flirties! They sent me some jewelry from their Spring 2011 and Summer 2011, it goes great with the Vera Bradley colors! 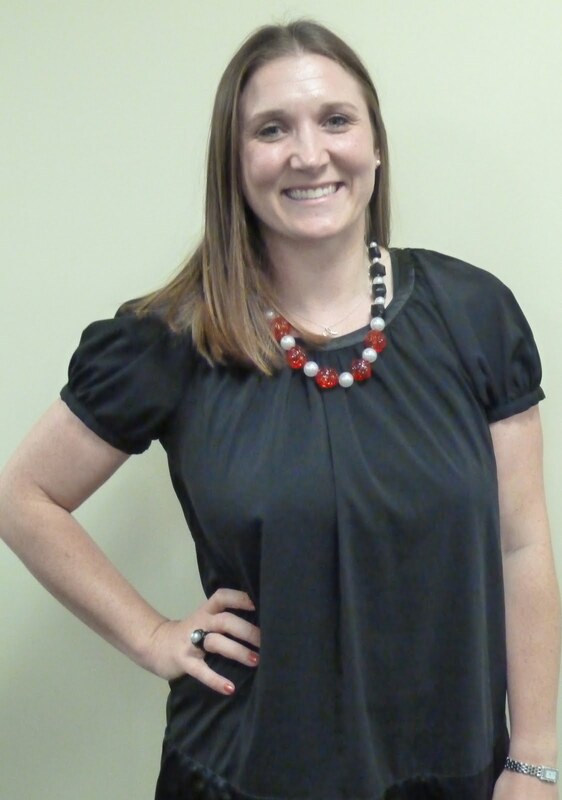 They make Vera Bradley color coordinated necklaces, bracelets and earrings! I wore a couple of pieces to work and got a lot of compliments. The necklace I wore matches perfectly with Deco Daisy. I also took a set of bracelets with me since I was carrying my Folkloric Get Carried Away Tote. The colors coordinated so well, now I will have to pick up sets to go with all my favorite Veras! Here are the necklaces in English Meadow, Deco Daisy, Watercolor & Viva La Vera! Here are the sets of bracelets!! Look how amazing they go with the Veras! The colors look great! Folkloric was my favorite, but you know which one really surprised me?? Lemon Parfait! I havent really been into that color, but the bracelets look great with it and made me give Lemon Parfait a second look. 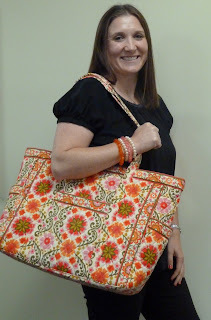 Here is a picture of me and the Folkloric Get Carried Away Tote and the Firties bracelets! Look at all this jewelry! Right now, their website is set up for wholesale orders, but they are in the process of changing it over to retail. You can view all of the items that they have available online and then place your order by emailing sales@fliritesearrings.com. Well this is way too much jewelry for me...good thing I know just the people to share with! You! So I will be giving away a necklace bracelet set to TWO of you! You will even get the Vera Bradley measuring tape with the necklace and the card holder with the bracelets! To Enter the Giveaway:Leave a comment here on the blog and tell me which piece of jewelry you are most excited about: necklace, bracelet or earrings! I will be accepting entries until midnight on July 6th and a winner will be drawn on July 7th by random.org. (Did you notice I added numbers to the comments a week ago, to get ready for the giveaway?? Probably not, haha) Winner must be in the US and will be contacted by email. You must reply within 48 hours. You can write out your email if you prefer ohmyvera(at)gmail(dot)com. Good luck! And dont forget to check out the Flirties website! Whoa, two Veras in one picture! Go me! Definitely tourists, we just dropped off save the date cards at the house and senate. Riviera Blue key fob sighting at work! OhMyVera! reader Stacia sent me a couple pictures of a Vera Bradley sighting at Clothes Mentor (a resale store) that had a ton of Vera! They have a lot of great styles and old colors. Thanks Sarah for sending in the pictures! If you could combine any two colors in one bag, which would you combine? Stephanie one of my readers sent me some pictures last month of a cake that she made. She had emailed me asking about another Vera Bradley cake that I had posted on my blog before. She was looking for a purple cake. Her cake turned out really cute! I love the Baroque print! I hope that someday I have an occasion that calls for a fancy cake and that the cake is Vera Bradley themed! :) She even made coordinating cupcakes! This is really making me want a cupcake! If you could have a Vera Bradley cake which pattern would you want? I just ran the San Diego Rock n Roll Half Marathon with my Raspberry Fizz ipod case! :) ran 13.1 miles and raised $1,700 for the Leukemia and Lymphoma Society! We had a baby shower last week at work for one of the women who is obviously having a baby pretty soon. We had a potluck brunch which was really yummy. I kind of failed because I forgot until the last minute that I signed up to bring a fruit salad and all that I had in my fridge was two pints of blueberries. It worked though. As an activity we decorated onesies. I am not the most crafty person, so I wasnt sure what I was going to do on mine, but then someone pointed out the obvious that I should do a Vera Bradley design. I was a little hesitant because she doesnt know if she is having a boy or a girl (it is going to be a surprise) but when she said that she doesnt really care about matching the babies clothes to their gender I decided to go for it. I had my camera case (a Raspberry Fizz Tech Case) on the table with me, so I used it as inspiration and went to town on my onesie. I like the way it turned out! Not too bad if I say so myself :) And they were super easy. We just used fabric pens to write on the shirts. I am surprised that this was the first baby shower I have been to where this was an activity. Next time I host a baby shower we will definitely be doing this! Vera Bradley has added an Online Outlet to the sale section of their webpage. It will be up through June 5th! I am temped to pick up some Thank You Cards, but I have more stationary than I need though! I do recommend the Charmed Pouch, I have one and love it! It holds a lot of stuff for being such a little pouch. Check out the online outlet by CLICKING HERE. Vera Bradley will be raising prices 5% in July when they release the Fall 2011 line. All existing products will also be retagged to reflect the price increase. So if you have your eye on anything, I would buy now. Click here to read the article. Vera Bradley Sunglass Cases at TJ Maxx in San Diego. 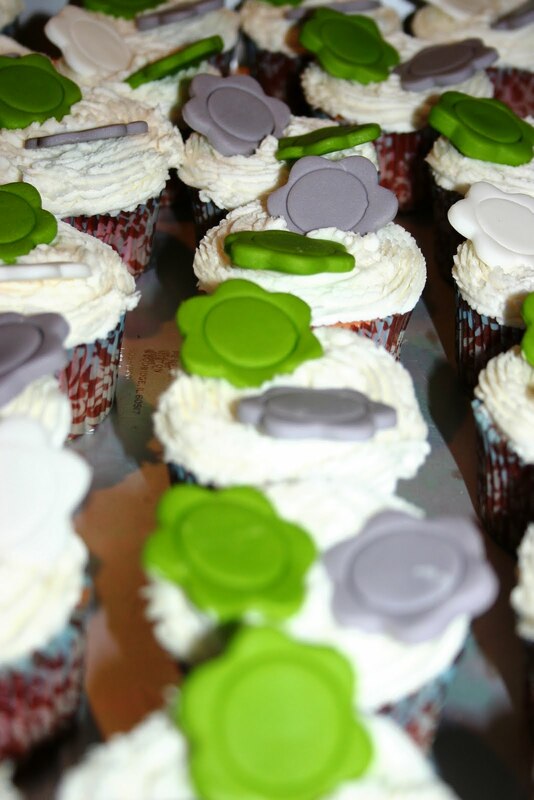 Frankly Scarlet, Puccini and Cupcakes Green.